When a soldier with a troubled past and a struggling songwriter agree to a marriage of convenience for the military benefits, neither expects much after saying “I do.” Then tragedy strikes, and the line between what’s real and what’s pretend begins to blur in this smart and surprising romance. 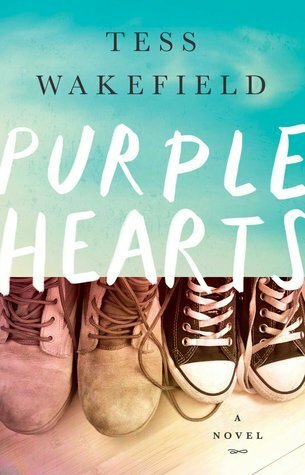 I'm slightly conflicted about my review of Purple Hearts. I really enjoyed it, but I wanted so much more from the characters. The storyline felt like a Nicholas Sparks classic, but it lacked the chemistry and romance that I was craving. The characters were fun and interesting, but I wanted them to connect more and show more emotion. The writing style was fast paced and light hearted, and I found myself reading through the novel very quickly. I loved how easily the novel flowed from one page to the next, but when I had about 20 pages left in the book I started to panic a little because it seemed like so much more needed to happen. As much as I enjoyed the first portion of the book, the last bit seemed rushed and cut short. Purple Hearts is a fun, fast paced book filled with relatable characters and real life issues. I found myself constantly wondering what I would do if put in the situations that the main characters faced. I laughed and I cried (just a little! ), and I found myself not wanting this novel to end. I would definitely recommend this novel to readers who enjoy Nicholas Sparks, JoJo Moyes and other contemporary romance novels. *Thank you Atria and NetGalley for providing me with a copy of the ebook in exchange for an honest review.